Kali Teaches Us How to Do Anger Right. Our society has an anger problem. Either we believe anger is bad and should be swept under our emotional carpet, or we have a tendency to deal with anger by lashing out mindlessly. Neither of these options is helpful, healthy, nor produces the desired results. When we are angry, someone or something has violated our boundaries, threatened our safety, or the existence we have carefully cultivated for ourselves. Anger is our psyche screaming, “oh, hell no!” to personal or societal injustices. We have a right to be angry in the many situations when anger rears its ugly head. Anger serves a purpose; righteous anger can be channeled to solve problems mindfully. Wrathful deities in Buddhism and Hinduism unlock the secrets for dealing with anger constructively. They can provide us with guidance when anger takes hold of our body and mind. One example is the Hindu Goddess Kali. 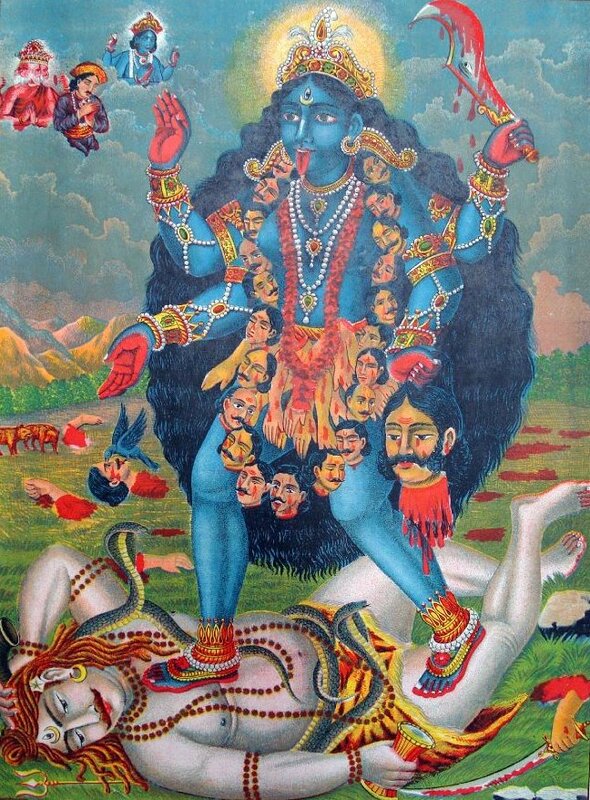 Kali is a badass, a powerful representation of the feminine force of Shakti. In tales of Kali, her righteous anger in bloody battles vanquishes demons and protects humanity from the forces of evil. Even her consort Shiva had a healthy sense of awe for her powers. Kali was so enraged after one battle she was only able to calm down after she trampled Shiva. Another time when Kali was on a rampage Shiva calmed her down by challenging her to a dance contest. At the end of another battle Shiva pacified Kali when he transformed into an infant for her to suckle. The divine, destructive forces represented by Kali and Shiva exists within us all. Like Kali, we all fight demons. In our personal lives, these demons represent daily struggles with attachment to our ego as it manifests through unhealthy behaviors or battles we fight with contentious people in our lives. We can enlist Kali’s help to destroy our attachment to ego or we can allow our ego and anger to consume us. Wrathful deities possess protective energy. Their anger can also be generated as a reaction to social injustices. Wrathful female deities actions are not unlike a mother’s protective behavior towards her offspring, fiercely shielding them from harm. Just like a mother will go to lengths to protect her child from harm, devotion to wrathful deities protect worshippers from kleshas. Kali’s mantra, Om Klim Kalikaylei Namaha, protects our mind from negative thoughts, speech, and action. We have the ability to determine whether or not to deal with social injustices by lashing out violently with words or actions, or whether we allow our thoughts to guide us to right speech and action. Collectively, this is how transformative social movements generate energy and increased momentum in order to produce results. What Kali teaches us is that anger is okay, but there are positive and negative ways to channel our anger. Just like Kali, our anger can become uncontrollable rage if it is not channeled properly. However, we have the ability to generate anger in the face of injustice and to temper that anger to the point it is transformed into thoughtful action. I’m not suggesting we trample significant others, but perhaps we should dance more, and engage in productive activities that nurture others and ourselves more. Anger is a secondary emotion; it is a chimera. Anger masks primary emotions such as fear, sadness, confusion, frustration, or disappointment. When we say we are angry with a partner it is for a reason. We may be disappointed by decisions they have made or confused by actions they take that are perceived as contradictory to the health of our relationship. On a societal level, we may be sad at the treatment of minority groups or disappointed when our government or leaders made decisions that do not benefit us. These primary emotions are difficult to process and accept, so we turn to anger as an outward expression of these painful feelings. In order to effectively see anger as the illusion that it is, we must first identify the primary emotion it represents. Sit with it for a while. Examine the roots of its emergence. When we understand how anger arose in our mind and body, from a place of calm we can generate right thought in order to consider right speech and action. We must step away from the people or environment that generated our anger in order to have the distance necessary to gain a clear perspective. In the heat of the moment when the anger emerged our feelings can be too raw and overwhelming. A quiet place to contemplate how anger emerged allows us time to reduce our emotions, uncover what they really are, and determine how to thoughtfully deal with the situation. Kali wasn’t angry at the demons she fought. Her wrath sprang from fear of a world ruled by the greed, suffering, and ignorance of the true nature of ego and the cycle of birth, life, death, and rebirth. Her actions cut through ignorance and were an attempt to liberate us from eternal suffering. Her stories teach us wrathful actions for noble reasons are justified. However, if we allow our anger to spiral out of control in the end we end up doing more harm that good. 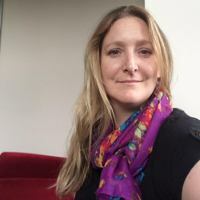 Natalie Keefer is a Professor of Social Studies Education in Louisiana. She enjoys traveling, yoga, gardening, and mindfulness practices. Natalie proudly belongs to a geriatric poodle. You can check out her website here.